A new network that is bringing together expertise from universities, government and industry is implementing a new vision for training the next generation of medical physicists. Ultrasounds, X-rays, MRIs and nuclear medicine are only a few examples of the essential contributions of medical physicists. The field of medical physics applies the principles of physics to medicine, from diagnosis to treatment, and seeks to quickly transform scientific discovery into clinical applications. Medical physicists are also clinical health care professionals providing service in fields such as radiation therapy, medical imaging, nuclear medicine or radiation protection, to name a few. The Medical Physics Research Training Network (MPRTN), which builds on leading research programs in medical physics at McGill University and Université Laval, will benefit from the Collaborative Research and Training Experience (CREATE) program of the Natural Sciences and Engineering Research Council of Canada (NSERC). 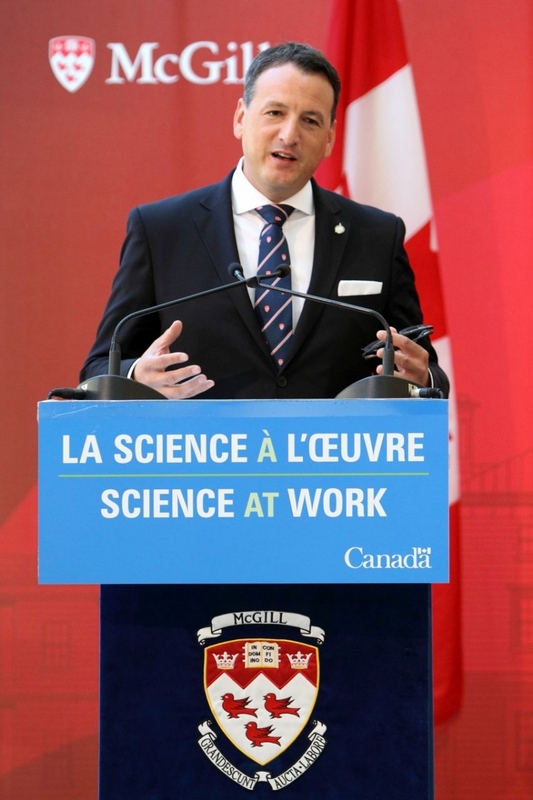 The announcement was made today by the Honourable Greg Rickford, Minister of State for Science and Technology, at an event held at McGill. "Thanks to medical physicists, we have, for example, made some advances in personalized, accurate radiation therapy, in which the radiation dose is adapted based on how a particular patient responds to radiation, as captured by imaging techniques during the treatment,” added Prof. Seuntjens. “And this new training program will help push these and other advances in medical physics much further." The MPRTN will receive $1.65 million from NSERC’s CREATE program, as well as additional funding from McGill University, Université Laval, the Research Institute of the McGill University Health Centre and the Canadian Nuclear Safety Commission. The network will also benefit from in-kind commitments from the medical devices industry, Harvard Medical School and the National Research Council of Canada. The initiative aims to enrich graduate education in medical physics by featuring new Ph.D.-level courses, more connections and collaborations with the basic sciences, as well as closer links with the medical devices industry, such as through internships for students. Research will focus on radiation physics, imaging and image processing, as well as radiation response and bio- and nano-science applications, leading to improvements in diagnostic abilities and treatments of cancer and other diseases. NSERC’s CREATE initiative helps science and engineering graduates add valuable job skills to their academic achievements. The funded networks announced today will be led by teams of Canadian university researchers who will help students develop leadership, entrepreneurship, communication and project management skills.